Spring Creek Village Homes: The ONLY Corner Canal Property for Sale in Spring Creek Village with 128 ft of water frontage on intersecting canals. Includes PAID water/sewer assessment & PAID Membership Certificate means low monthly HOA Fees! Here is the Triple Play: Boat Lift---Boat Davits---and a Step Down Boat Dock! Outside patio overlooks the water & pavers extends the length of the home and in front for extra parking. Also a screened area for watching dolphins in the canals, sunset views and enjoying the Florida outdoor living. New roof, new insulated carport, new siding, new hurricane shutters around the entire home. Inside is all drywall, crown molding, raised panel doors, upgraded kitchen with granite counters and a granite island, open floor plan, upgraded baths with full tiled showers. Furnished and turnkey, come and enjoy! By boat the Gulf of Mexico is just 12 minutes away, Estero Bay is 7 minutes. Fishing, beaches, shelling, waterfront restaurants, dolphins, so much to enjoy on the water. Clubhouse with planned activities, pool, hot tub/spa, tennis, shuffleboard, boccie ball, basketball, picnic area, water aerobics, billiards, darts, and much more!!! Friendly community come and enjoy! Spring Creek Village Homes: Coastal heaven. A new home never lived in located in Bonita Springs, Florida. 55+ community that has club house, pool, tennis court, shuffleboard and more. 90 feet of water frontage with new dock and electrical davits. Extra large landscaped lot. Parking for 2 to 3 cars, 3 bedrooms with ceiling fans. Large living area with ceiling fan. Inside laundry room with hook-up for washer and dryer. New black appliances in kitchen, center island with extra large pots and pans drawer. Custom master bath tile and glass door. Plenty of storage. Vanity with his and hers sinks. Crown molding throughout the house. Hardwood floors with vinyl in kitchen and baths. Direct access to the Gulf. In minutes you’re there. Spring Creek Village Homes: Remarkable home. Key West colors and open floor plan. New vinyl plankin flooring thruout. UPDATES galore. New roof, new air conditioner, new windows and doors, dry walled with fresh tropical colors. Master bedroom is situtated on the creek front with open windows for this spectacular view. Florida room is situated on the creek viewing area as well as a screened lanai. Wood walkway to the dock with a sitting area built in. Boat lift plans with Nelson Marine is in the owners possession. Freanch doors to the master bedroom, dining room and the 3rd bedroom. New blinds thru out. This home has a very happy feeling, peaceful and serine. Community is located close to the Coconut Point Mall and the Hyatt Regency Coconut Point. Gulf access from the semi private dock and walkway in just 10 to 12 minutes. A fishermans dream. Creek has much to see including watching the dolphins play and fish, manatee swimming by and of course kayakers and boaters. It is a very active community with planned events thru out the year. Home includes the Spring Creek Amenities Share and the BSU water ans sewer assessment has been paid in full. A $15,000 value. Call today for your private viewing. Spring Creek Village Homes: There is no comparison to this 2014 Custom Built Jacobson Double Wide Manufactured Home with 1652 Square feet of air conditioned living space! So many upgrades starting with the Architectural Shingles rated for 25 years, extra roof vents for better ventilation. The Flood Insurance is based on the home being set 2 feet above the FEMA Flood Plain for the best rates! On the Home Owners Insurance there is a full replacement value for the home! Extra tie downs underneath and heavy duty construction for the carport. A generator plugs into the dryer outlet for all the 110 lights, fans, TV, microwave, coffeemaker, toaster, etc. Bay windows in the living room and kitchen, thermal windows throughout, LVP which is Luxury Vinyl Planks flooring, Vaulted Ceilings, upgraded Kitchen Cabinets, Separate jetted bathtub and Shower with glass doors in the Master bath, 11 x 26 Family Room overlooks a landscape area and side open patio area. The Clubhouse has planned activities, pool, spa/hot tub, tennis, pickle ball, basketball, shuffleboard, boccie ball, horseshoes, picnic area, boat storage compound, community boat dock and ramp, by boat The Gulf of Mexico & Estero Bay are just minutes away. Spring Creek Village Homes: This is a great home with lots of updating. Both the master bath and guest bath's have been remodeled. Ceramic tile walk in shower with a seat in the guest bath as well as a new vanity and sink and flooring. Master has a tub shower combination with tile surrounding and new vanity and flooring. New windows, drywalled and painted. Laundry is inside for convenience. New boat lift in 2016. Close to the Estero bay for fishing and the Gulf of Mexico in just 10 to 12 minutes. Great sitting area in the back on the canal with a paver patio area and flowering terrace area. The community is very active with all kinds of activities in the clubhouse. Many amenities. If you want to stay busy you can with cards and games almost every day/night or just relax on your private piece of paradise. Call today for your private viewing of this great home in an adult community. A share in the Amenities Corporation is included in the sale of this home which makes your quarterly maintenance fee only $195. Spring Creek Village Homes: Finance options are available. Ideally located Gulf Access WATERFRONT Turnkey home on a 50-foot canal. It's the perfect place for entertaining and boating. What makes this property so unique within the community is that it has approximately 90 feet of waterfront on a spacious concrete deck/patio. Boat davits are sufficient for 13,000 lbs. Spring Creek Village has a number of amenities, a clubhouse, pool, hot tub, tennis, bocce ball, pickle ball, community kayaks and bicycles, community events, boat storage, fishing pier, and boat ramp. 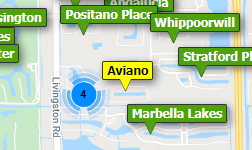 The Village is located near Coconut Point Mall and offers easy travel to both Fort Myers and Naples. Spring Creek Village Homes: Gulf access canal! Located in Spring Creek Village, this upgraded Turnkey furnished 2 bed 2 bath home is perfect for the boating lifestyle! The open floor plan features a large kitchen with new cabinets, laminate wood flooring throughout, crown molding, updated tile in the bathrooms and new water heater. New tile flooring highlights the Florida room, which offers relaxing canal views. The 4500 lb boat lift allows for easy access to the water and is just minutes away from New Pass! Spring Creek Village has a number of amenities, a clubhouse, pool, hot tub, tennis, bocce ball, pickle ball, community kayaks and bicycles, community events, boat storage, fishing pier and boat ramp. The Village is located near Coconut Point Mall and offers easy travel to both Fort Myers and Naples. Spring Creek Village Homes: Price Improved! OVER 1300 Sq FEET under air! LOWEST priced waterfront home in Spring Creek Village! It’s all about the water and the Southwest Florida Lifestyle. This lovely 2 bedroom, 2 bath, turnkey furnished home sits on your own gulf access canal lot where you can boat to the gulf through Estero Bay in under 15 minutes while passing by Lover’s Key. While making your way around Estero Bay you will be greeted by many birds, dolphins, manatee and many species of fish. You’ll have covered parking, a storage room and laundry at the home. Take a short drive or a bike ride to many shops and restaurants at Coconut Point Mall or spend the day at one of the area beaches. Boat to restaurants in Bonita Springs, Naples and Fort Myers Beach. Spring Creek Village is an active community with many planned activities, a community pool with spa, tennis court, bocce ball courts, horse shoe pit, shuffleboard, billiards, a fishing pier, a boat ramp and a boat storage lot. A one year American Home Shield Warranty is included in the sale as is the HOA Membership Certificate. Water and sewer assessment has been paid off on this property. Don’t wait! Your slice of paradise is waiting for you. Spring Creek Village Homes: Gulf Access from the Community boat and into the Gulf in minutes makes this community a very desirable location. This manufactured home has 2 bedrooms/2 baths, vaulted ceilings in the living,dining room and kitchen. An open floor plan with a breakfast bar/pass through, awnings for storm protection and storage shed. Clubhouse with planned activities, tennis, shuffleboard, boccie ball, basketball, kayaking, bicycling, boat storage and fishing pier at fresh water lake. From the community boat ramp to Estero Bay is 7 minutes or the Gulf in 12 minutes by way of New Pass and Lovers Key State Beach which is one of Florida's Top Ten Beaches! Owned land, low fees, convenient location in a Gulf access community! Located off the busy highway down Coconut Rd on the shores of Spring Creek this hidden community enjoys boating at it best but minutes to Coconut Point Mall, 41 & I -75 between Naples & Ft Myers. Spring Creek Village Homes: OWNED LAND... LOW FEES...GULF ACCESS...LOCATION, LOCATION, LOCATION! Three bedrooms home, Well maintained with lots of updates, most furniture stays, some new cabinets in kitchen & dining room, convection range, built in bar in the family room, electrical light switches and plugs have been changed to white, upgraded baths, enclosed Florida room has 2 closets and could be used as a third bedroom, Sprinkler system for front flower box, fresh paint outside, Extra storage shed in back, private yard as this home is on the perimeter of the Village. Home has a roof over that has been recently cleaned and 2 coats of 10 year sealer, Cabinets in the shed stay, extra refrigerator in the front room closet stays, newer stack able washer and dryer, A/C replaced in 2014, private backyard which would be good for privacy or pets. Home is light and bright inside, Electric fireplace in Family Rm, 55+ community where you own your land, Activities galore, clubhouse, heated pool, tennis, shuffleboard and social events. Spring Creek Village Homes: Great little pieceo of paradise in a very active community. Centrally located between Naples and Ft. Myers in Beautiful Bonita Springs. Boating community just minutes from the Gulf of Mexico and Beaches. 2 bedrooms and 2 baths, ining room, kitchen, Florida room and Lanai. HOme has some updating done. Great location close to the end of Windward Blvd, at the rear of the community. Amenities include community Boat Ramp and a boat compound for storage, Tennis, Pickleball, Basketball, Bocci, Pool, Hot Tub, Shuffelboard, Picnic/Grill on the Lake, as well as a clubhouse with cards most nights, Billiards and more. Close to Coconut Point Mall, SWFL Internationa Airport, Florida Gulf Coast University. Here is your chance for a little get away for your winters or even a great investment for rental income. Call today for your private viewiong. Need professional assistance selling your property at Spring Creek Village Bonita Springs? Find out how an Area Specialist can help to generate more property exposure in order to get the most money for your investment in the least amount of time.